William H. Lawrence and Klaravich Stables' Practical Joke did not mess around when taking Monday's G1 Hopeful Stakes, closing strongly down the stretch to win by a neck at the wire. The juvenile son of Into Mischief complete seven furlongs over Saratoga's fast main track in 1:23.39 for meet-leading jockey Jose Ortiz and trainer Chad Brown. In a strange incident at the start of the race, the favorite Classic Empire was getting out sharply just after the break, then appeared to wheel to his right, unseating jockey Irad Ortiz, Jr. The rider was reported to be okay, and outriders quickly apprehended Classic Empire. Meanwhile, Pretty Boy Flash had jumped out to lead the pack through a steady first quarter of :23.80, about a half-length in front of Royal Copy. Practical Joke was in behind them on the rail, and Bitumen kept him company on the outside. Royal Copy took over the lead entering the far turn, with Pretty Boy Flash hanging in there as they began to turn for home. Jose Ortiz on Practical Joke waited to angle out until the field straightened for home, and had about two lengths to make up at the head of the lane. Ortiz asked the question and Practical Joke answered strongly, fighting on past the dueling Pretty Boy Flash and Royal Copy to win by a neck on the wire. Royal Copy finished second, and Pretty Boy Flash was third. It was another two lengths back to Bitumen in fourth. Bred in Kentucky by Whispering Oaks, Practical Joke was a $240,000 Keeneland September yearling sale purchase. He broke his maiden at first asking by five lengths at Saratoga, and improves his career record to a perfect 2-for-2 with the Hopeful win. He now boasts earnings of $250,000. 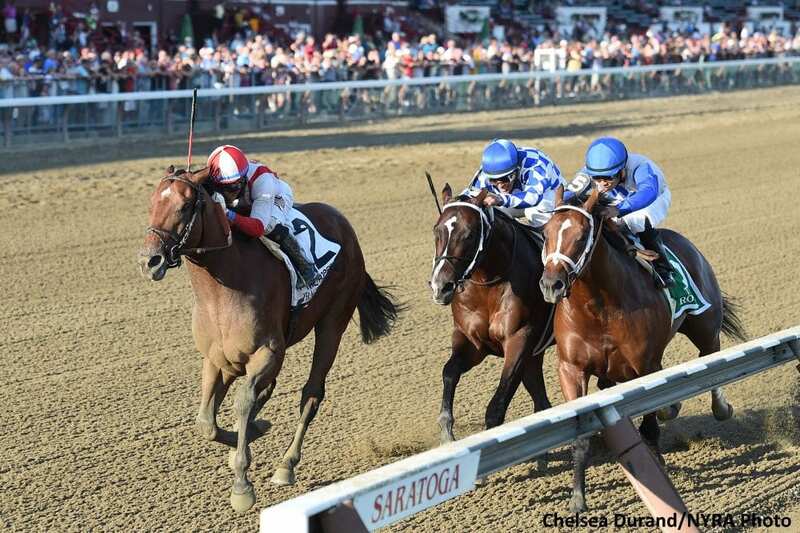 This entry was posted in Racing, Videos and tagged Chad Brown, classic empire, Hopeful Stakes, into mischief, jose ortiz, practical joke, saratoga by Paulick Report Staff. Bookmark the permalink.